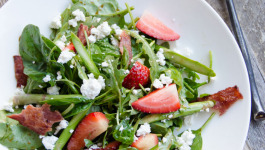 This is a nutritious and vibrant spring salad with spinach, arugula, asparagus, and strawberries. 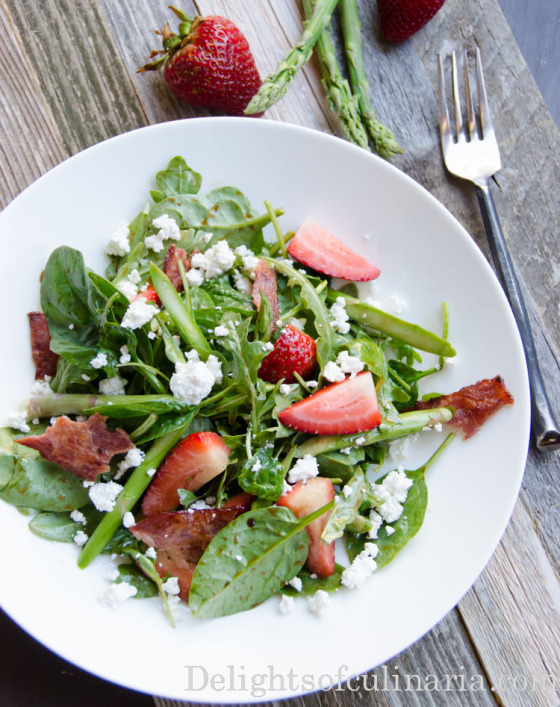 Crisp green leaves and bright sweet strawberries are tossed in a light balsamic vinaigrette, then topped of with turkey bacon and feta cheese. It’s so delicious and healthy. * Good quality balsamic vinegar and olive oil is a must for perfect results of this dressing. I used balsamic vinegar from Trader Joes and Organic California Olive Ranch Olive oil. Using a hand blender or blender mix balsamic vinegar,sugar,salt,black pepper, and oil. Then add lime juice and pulse couple times. ( You can adjust salt or sugar to your liking). If the dressing to thick,you can liquify by adding a little bit of water. Toss spinach, asparagus, arugula ,strawberries, bacon, and candied nuts with some dressing. Top with cheese and serve.